grough — Is it time to ditch the old walkers' mnemonic as magnetic north migrates east? Magazine / News / Is it time to ditch the old walkers' mnemonic as magnetic north migrates east? The saying ‘add for mag, rid for grid’ helps remind us the correct procedure for using a map and compass, but the slow movement of magnetic north means the phrase is becoming out of date. Ordnance Survey said, for the first time in Great Britain since the 1660s, magnetic north has moved east of grid north in parts of the country. The change is important for those wanting the most accurate navigation though, in practical terms, it’s unlikely to have too much significance in the near future. Most accomplished map readers are aware that the OS grid lines on maps are aligned to a different point from magnetic north and, indeed true north. True north is of little importance to those navigating the British countryside but, particularly in mountain terrain in low visibility or whiteouts, the ability to determine a bearing and walk on it can mean the difference between life and death. Magnetic north and grid north are used to do this. The technique is to align the compass baseplate in the direction of travel you want to follow, then turn the compass’ housing so its lines coincide with the blue grid lines. You can then read the required bearing on the housing. The OS grid is a rectilinear set of lines transposed on to the curved surface of the earth. Magnetic north is constantly, if slowly, moving and is thought to be dependent on the liquid core of the earth. It is currently migrating from northern Canada towards arctic Russia. Because outdoor enthusiasts’ compasses point towards the magnetic pole, a small adjustment is needed to align the floating needle in the instrument with the north marking of the housing after taking a bearing. Hence the mnemonic. If you’ve taken a grid bearing on the map and want to transfer this to you compass, you need to add the appropriate number by rotating the housing before walking on the bearing. This has, for the past few decades, been between about one and two degrees, dependent on where in Britain you are. The further east and south you are, the greater the difference, or magnetic variation. But five years ago, for the first time in centuries, this reversed in parts of England. The far-south-west was the first area where the variation was actually to the east, so no longer did you need to add, but rather subtract, when going from map to compass, rotating the housing clockwise. In practice, the difference was so small as to be not worth bothering with when walking, so in practical terms, grid north could be said to be the same as magnetic north. Slowly, that area has been expanding. Ordnance Survey has released a map showing where the effective equivalence line lies at the moment. Starting in Devon, the zero variance line passes though west Wales, the Llŷn peninsula, clips Anglesey and the Rhins then runs through Kintyre, Mull, Morven, Skye and Lewis. Anywhere west of that line needs a small subtraction from the grid north reading; to the east, a small addition is still needed. Close to the line, east or west, the difference can pretty well be ignored. For instance, the current figure for Plymouth is 13 minutes east, about a fifth of a degree. If you can navigate to that level of accuracy using a walkers’ compass, you’re doing exceptionally well. If you deviate by one degree, after walking for a kilometre, you’ll miss your target by about 17m. 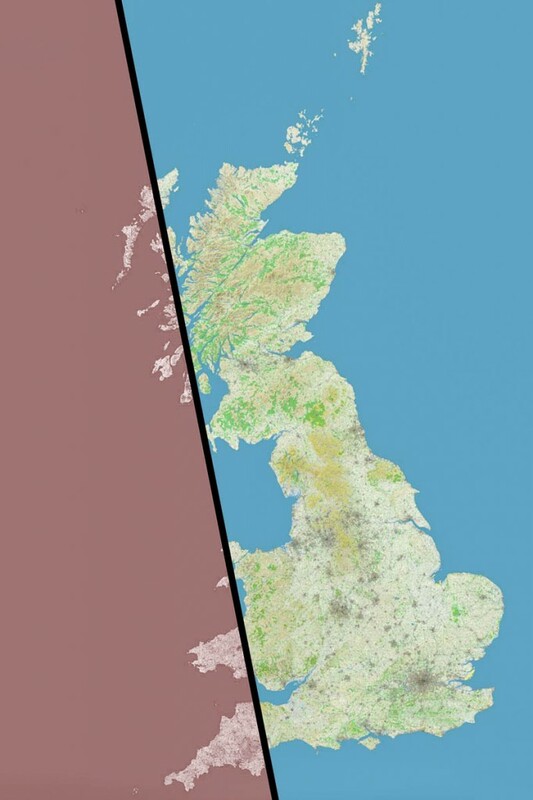 Ordnance Survey has also released dates, based on data from the British Geological Survey, for when equivalence between grid and magnetic north for various locations will occur. Cardiff will align in May 2020; Glasgow by December that year; Aberdeen in October 2025 and Newcastle a month later. London won’t have a zero variance until May 2028 and Norwich’s navigators will have to wait until October 2032 to ditch the mnemonic. OS says it marks magnetic variations and the calculated date on all its paper maps. New maps in the areas where it has switched to the East will have a new diagrammatic representation, it said. So it could be time to ditch the old mnemonic. The British Geological Survey, in its blog, suggests for areas where the deviation has switched, you can use the new: ‘east is least; west is best’, least meaning subtract; west add. This only works when going from map to compass, so it’s less than perfect. But at least it rhymes, unlike the old one. More details are on the OS Blog. As a sailor I was long ago told by an instructor that any helm who thinks he can steer and keep boat within 5 degrees of intended is a fool, who will soon be in trouble. The mountains are more stable than seas but I doubt many people can achieve accuracy of one degree. However as thats one mile out over a sixty mile walk you probably will never need any such accuracy as unless in complete whiteout there will always be signs and indications (streams, folds in hills etc) to keep you on track well before you go far astray. Obviously best if you have latest map with current variation but hardly a reason to despair if you find yourself with with old map and no idea of local variation. Here's another Mnemonic : Error is West, compass is best, error is East compass is least. Mick Hill, North of Tyne MRT. 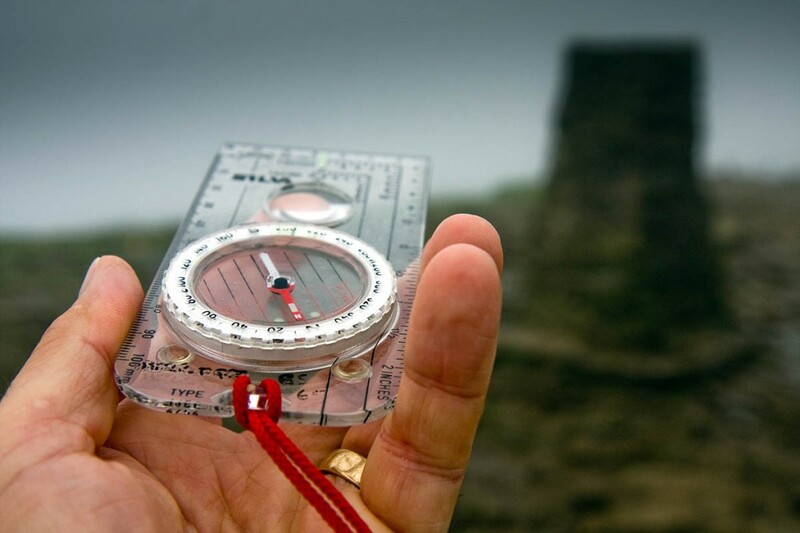 Remember, using a compass is only one component of accurate navigation on the hill. Using a compass is only one of the skills needed for accurate navigation. The compass use is only one of many skills used for accurate navigation with the map being perhaps the most important. A bit of a side issue but my Silva suffered reverse polarity on Pendle Hill yesterday.